Specifications of yet another unreleased phone has become public, courtesy of GFXBench. 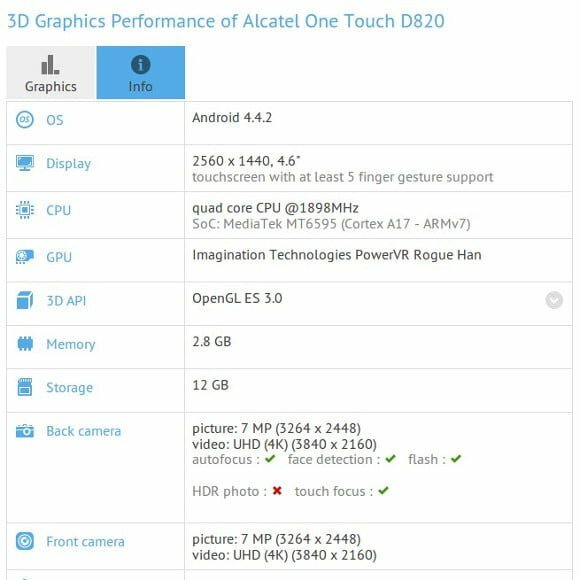 As per the specifications captured by GFXBench, the Alcatel One Touch D820 comes with a 4.6 inch QHD screen, octa-core processor, 3 GB of RAM and dual 4K capable cameras. We are not sure if the front-facing camera will be equipped with 4K video recording though. As per the specifications, the Alcatel One Touch D820 looks like a beast. Alcatel has been launching some good smartphones of late in India. It they manage to price this device well, I don’t see a reason not to buy Alcatel Android smartphones. Awesome*….specs,i think now MTk performs well off late,just thinking buy now.but not affordable price tag. Good specifications from a branded company. But it should have used qualcomm chipset instead of the third class mediatek chipset.